The insurance industry generates nearly $2 trillion a year in revenue- yet still runs on paper-based processes. 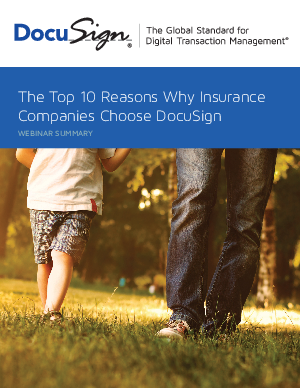 Read the report and discover the top 10 reasons why Insurance Companies choose DocuSign for their Digital Transaction Management and eSignature solution. DocuSign is revolutionizing digital transaction management for all players in the insurance sector.